I love to be outdoors in the sunshine. I often take pictures along the way but the sunshine I love is both a friend and a foe to my camera. While the light is brilliant it washes out color and creates deep contrasts with the shadows it casts. Often, these shadows get in the way of the image I want to capture. Sometimes though, the shadow can enhance the image, even become the image. Here I took a low shot of a small dry twig from the garden. 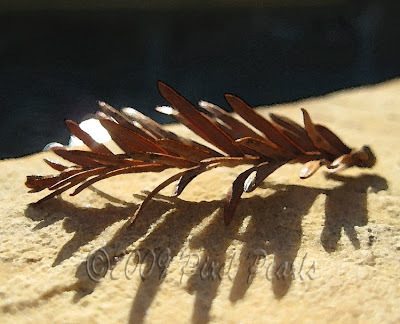 Set on a sandy brown stone wall it cast a long shadow in the afternoon sun. Like a child at play making handshadows, they seemed to portray a host of possibilities in their definition. This shadow captured my imagination and I captured this image. In the digital darkroom I did very little to change the original image. I cropped it to guide our point of entry. Then I filtered it gently, drawing out the contrast and softening the distractions. I like the possibilities in the lines that remain. This picture is very interesting. I like the simple elegance of the subject, and as you point out in your explanation, the contrast of form and shadow. Unlike chirosciro where the subject dissolves into blackness, the shadow provides a mirror image of the form. Nicely done!